We’ve figured out how to pack a sun hat. 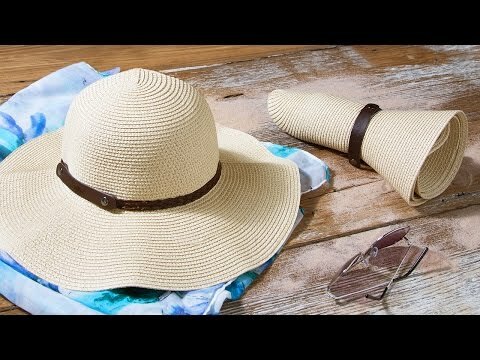 This packable sun hat rolls up without losing its shape. Its flexible fibers protect you from the sun and also protect the shape of the hat even after you’ve folded it. Roll it, then fasten the braided leatherette to keep it compact. Dimensions: 10.5" x 5" x 3"
Bought for trip to Hawaii. Rolled and put in carry on. Used today and looked great! Gave this to a friend for her birthday. She loved it so much she immediately bought one to give to someone else. I love that I can roll it up and take it in my travel bag. Durable and attractive. I love my hat! It’s very stylish and will travel well! Bought this as a gift for my stepmother when we were on a vacation and she loved it! It has now been on two other trips too. How do you pack a hat? We’re not sure about the regular kind—but this packable sun hat rolls up without losing its shape. The SunLily hat’s flexible wooded fibers protect from the sun, but also stretch and fold into a compact roll you can snap to keep it that way. The braided leatherette strap won’t pop open when you slip it into a purse or suitcase. 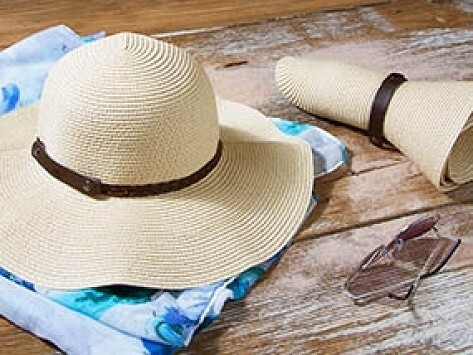 We like that it looks like a traditional, beachy straw hat, but it functions better. In our past travels, we ended up carrying our sun hats rather than packing them, afraid of in-luggage crushing. SunLily goes right into your suitcase or bag. Hats off for this fashionable, functional invention.